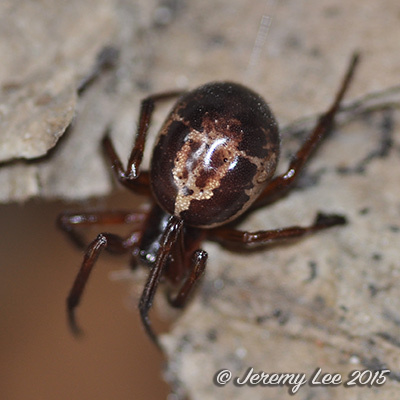 Steatoda nobilis is a spider in the genus Steatoda, known in the United Kingdom as the noble false widow and often referred to as the false widow. As the common name indicates, the spider superficially resembles and can be confused with the black widow and other spiders in the genus Latrodectus, which can have medically significant venom. Steatoda nobilis is native to Madeira and the Canary Islands from where it allegedly spread to Europe, and arrived in England before 1879, perhaps through cargo sent to Torquay. In England it has a reputation as one of the few local spider species which is capable of inflicting a painful bite to humans, with most bites resulting in symptoms similar to a bee or wasp sting. Steatoda nobilis has a brown bulbous abdomen with cream coloured markings that are often likened to the shape of a skull. The legs are reddish-orange. Females range in size from about 9.5 to 14 mm in size, while males are 7 to 11 mm. The distribution of Steatoda nobilis is expected to increase northwards in the UK, due to, at least partly, mild winters in recent years.